La Calavera Catrina ('The Elegant Skull') is a 1910 zinc etching by Mexican printmaker José Guadalupe Posada. The image has since become a staple of Mexican imagery, and often is incorporated into artistic manifestations of the Day of the Dead in November, such as altars and calavera costumes. The etching was part of his series of calaveras, which were humorous images of contemporary figures depicted as skeletons, which often were accompanied by a poem. 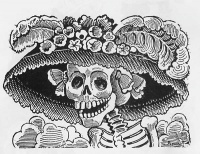 Popularized by José Guadalupe Posada, this Catrina is the skeleton of an upper class woman, and one of the most popular figures of the Day of the Dead celebrations, which occur during two days, November 1 and November 2, corresponding with the Catholic holy days of All Saints Day and All Souls Day. Although these holy days have a long cultural history reaching into the prehistoric traditions of several European cultures, many aspects of the Mexican festival have indigenous origins in an Aztec festival dedicated to the goddess Mictecacihuatl. After the conquest of Mexico, the Spanish superimposed their cultural traditions upon the similar Aztec festival and a synthesis occurred. Posada was a cartoonist too, and for this, the main award of the Encuentro Internacional de Caricatura e Historieta (International Cartoon and Comic Convention) is called "The Catrina". The image was incorporated into Diego Rivera's mural Dream of a Sunday in Alameda Park, which also includes images of his wife Frida Kahlo, Posada, and a self-portrait of Rivera. Notable paper cutter Marcelino Bautista Sifuentes has also recreated the famous "La Calavera Catrina" in papel picado. In addition to its use as a holiday symbol for the Day of the Dead, the image also has been reinterpreted in numerous forms, including sculpture. Unless indicated otherwise, the text in this article is either based on Wikipedia article "La Calavera Catrina" or another language Wikipedia page thereof used under the terms of the GNU Free Documentation License; or on original research by Jahsonic and friends. See Art and Popular Culture's copyright notice. This page was last modified 11:30, 2 January 2019.